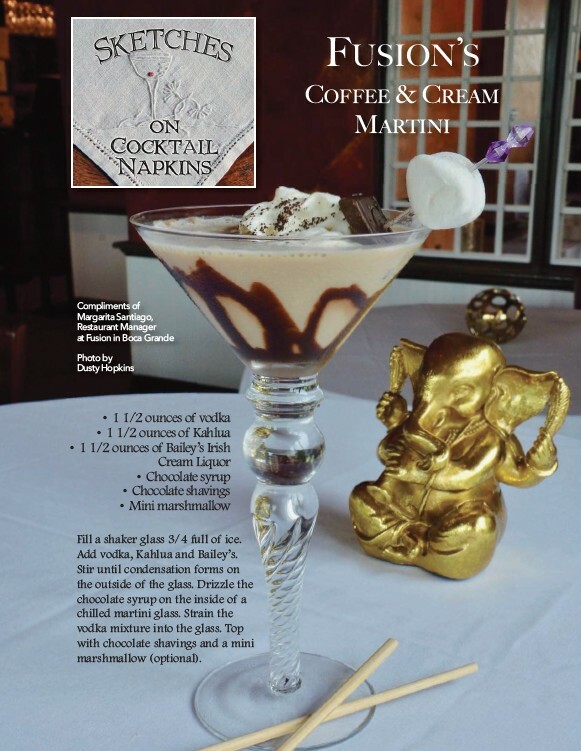 FUSION’S COFFEE & CREAM MARTINI Compliments of Margarita Santiago, Restaurant Manager at Fusion in Boca Grande Photo by Dusty Hopkins • 1 1/2 ounces of vodka • 1 1/2 ounces of Kahlua • 1 1/2 ounces of Bailey’s Irish Cream Liquor • Chocolate syrup • Chocolate shavings • Mini marshmallow Fill a shaker glass 3/4 full of ice. Add vodka, Kahlua and Bailey’s. Stir until condensation forms on the outside of the glass. Drizzle the chocolate syrup on the inside of a chilled martini glass. Strain the vodka mixture into the glass. Top with chocolate shavings and a mini marshmallow (optional).